With plastic pollution in the international limelight this year, Maharastra’s ban on plastic stands out as a shining example in India’s larger effort to align with international priorities. The view on the ground however, is that the ban in its current form is weak and is likely to fail. Global initiatives like Earth Day, Environment Day and Oceans Day, among others, are all focusing on action against plastic pollution in 2018. 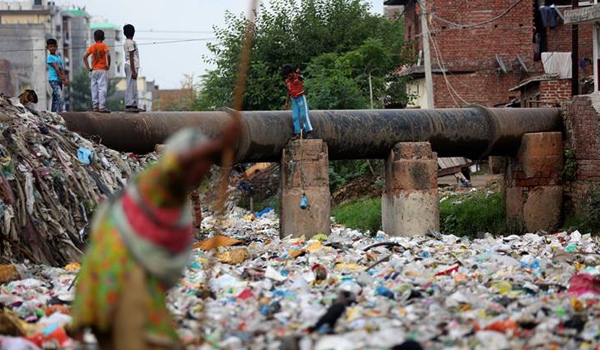 The specific issue of plastic waste has perhaps never had so much international focus and India has asserted its role in the global efforts. India, infact, is the global host of June’s World Environment Day which urges nations to “beat plastic pollution”. So when India’s second-most populous state declared a blanket ban on single-use plastic, on the auspicious day of the Maharashtrian new year, it struck the right cord. The ban has ignited much debate and got people talking about the perils of plastic. But those who are digging deeper into the modalities of the ban document are worried whether this could be yet another empty threat in the state’s attempts to control plastic pollution. Declared on March 23, the plastic ban notification is to come into full effect on June 23, giving vendors, consumers and the plastic industry, three months to find alternatives to single-use plastic. Today, as the state stands halfway through this three-month grace period, low awareness about the modalities of the ban, strong lobbying by the industry and a lack of realistic alternatives and timelines are some of the reasons that critics feel the ban in its current form could remain just on paper. The ban notification, Maharashtra Plastic and Thermocol Products (Manufacture, Usage, Sale, Transport, Handling and Storage) Notification, 2018, comes six months after the Maharashtra environment minister, Ramdas Kadam took up the issue of plastic pollution with the Cabinet. In the notification, the “manufacture, usage, transport, distribution, wholesale and retail sale and storage, import of the plastic bags with handle and without handle, and the disposable products manufactured from plastic & thermocol (polystyrene) such as single use disposable dish, cups, plates, glasses, fork, bowl, container, disposable dish/ bowl used for packaging food in hotels, spoon, straw, non-woven polypropylene bags, cups/ pouches to store liquid, packaging with plastic to wrap or store the products, packaging of food items and food grain material etc.” has been banned in Maharashtra.